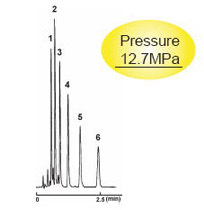 COSMOSIL COSMOSIL Ultra-High Performance Columns｜NACALAI TESQUE, INC.
Ultra-High Performance Chromatography is a powerful tool for very fast and efficient separation. - Suitable for basic compounds. - Usable under the same condition as C18. 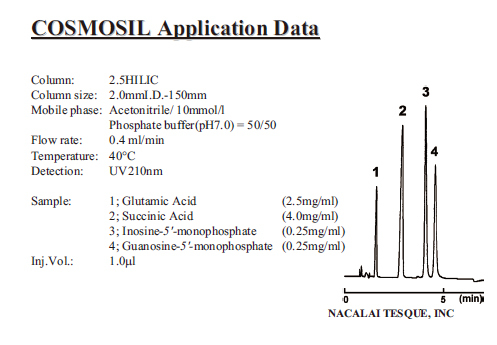 COSMOSIL C18-MS-II (Particle size : 3 ・ 5 ・15 µm) is also available. 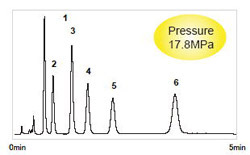 COSMOSIL 2.5Cholester offers improved resolution for compounds difficult to analyze with C18 without changing analytical condition. 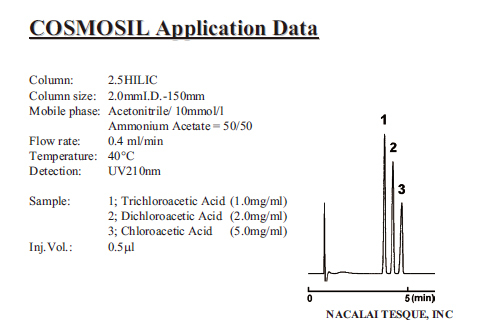 COSMOSIL Cholester (Particle size : 5 µm) is also available. 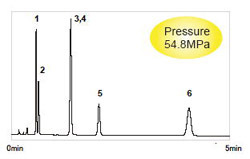 COSMOSIL 2.5πNAP provides greater performance in separating positional isomers and other closely related compounds which are difficult to analyze with C18. 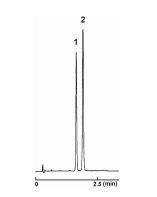 COSMOSIL πNAP Packed Column (Particle size :5 µm) is also available. 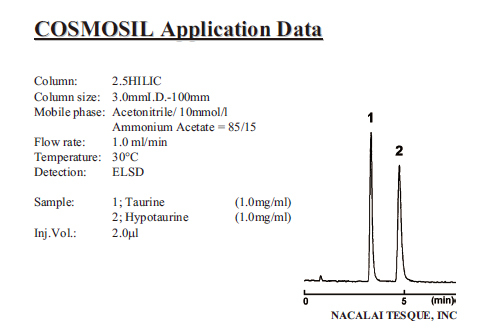 COSMOSIL 2.5HILIC can be used with any conventional LC systems. 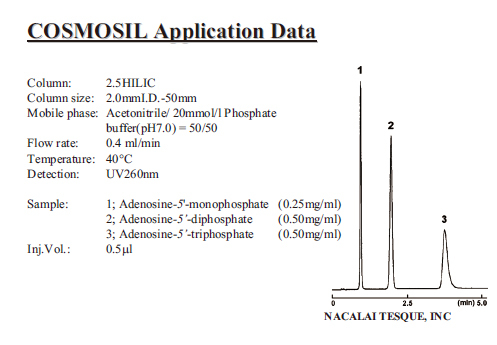 COSMOSIL HILIC Packed Column (Particle size :5 µm) is also available. Temperature range The maximum usable temperature is 60℃. However. for regular use, please use at a constant temperature between 20°C and 50°C. 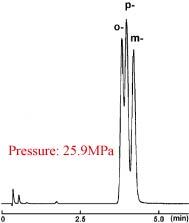 Note: For solvents with high viscosity, please watch the system pressure and keep it below 30 MPa. Also, please wash the column after using acidic mobile phases or solvents with high freezing points. - Always filter mobile phases using a 0.45 µm or finer filter before use. 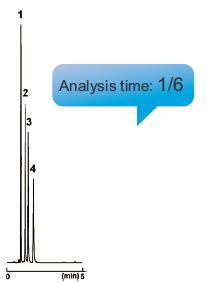 - Reproducibility may worsen when using a mobile phase that is more than 90% water. Washing method 1. Remove buffer, salts and/or acid from column: wash for 10-15 min. using the mobile phase last used, without buffer, salts or acid. 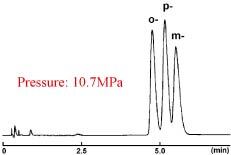 For example, if your mobile phase was 50:50 acetonitrile/20 mmol/l phosphate buffer, wash with 50:50 acetonitrile/water. 2. 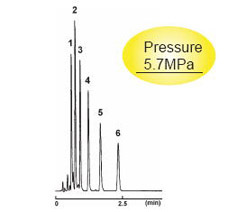 Remove adsorbed compounds and fix unstable baselines: Wash with 50:50 acetonitrile/water or up to 100% water. 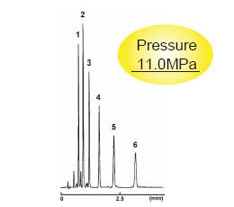 Storage conditions Remove buffer, salts and/or acid from column: wash for 10-15 min. using the mobile phase last used, without buffer, salts or acid. Usable solvents - Acetonitrile/water mobile phases are recommended. Other instructions - Retention increases with increased acetonitrile concentration. 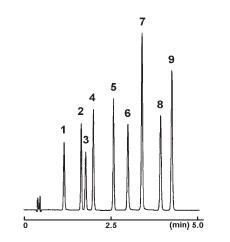 - Acetonitrile concentration should be within 0-95% (usually 50-95%). - Retention will decrease when using methanol/water mobile phases. 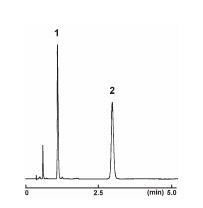 - Only use HPLC-grade solvents. - It is necessary to use salts or buffers for dissociating compounds. 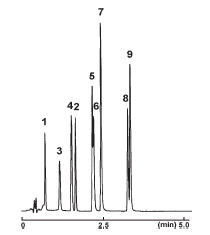 However, these have low solubility in the high-organic mobile phases used in HILIC mode. 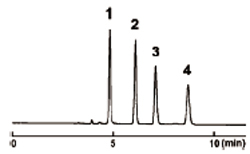 Phosphate buffers, widely used in reversed-phase, are not suitable for HILIC for this reason. 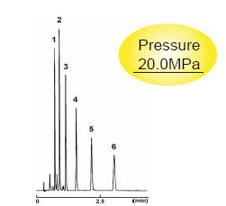 When using salts or buffers, the acetonitrile concentration should be 70% or less. Before use, please confirm that the additives are completely soluble in the mobile phase.